Soffits: What Are They and Why Do They Matter? Today we’re going to look at the reasons soffits are so important. Before we get into that, though, let’s back up and clear up something more important: What really are soffits? A soffit is the area between the outer wall of a house and the overhang of the roof. It is usually made of aluminum and vinyl. Most of us see and benefit from the presence soffits on a daily basis, but not many of us know their name or why they are important. 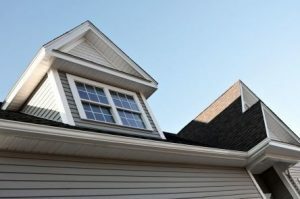 While it may seem that soffits exist to help make a roof edge look more complete, their purpose is actually more than simply aesthetics. While they can be decorated and painted to enhance a home’s look, they also provide an important finishing touch to a building. Without soffits, rafters and structural beams would be visible and exposed from below. This could allow these foundational innards of the roof to be exposed to the elements. An open rafter is much more likely to become rotten, mold ridden, water damaged or simply worn down. Soffits also protect you and your family from unwanted wild animals that might otherwise decide that your roof and attic area might be a nice place to live. Soffits prevent raccoons, squirrels, bats and birds from entering your attic and setting up a home. A well-constructed and closed soffit can save you the money you would have otherwise spent on animal control. In addition to keeping pests out of your attic, soffits also facilitate efficient attic ventilation, too. These simple overhang areas do so much more than provide a finishing look, providing a combination of important function and home design. Soffit installation and repair is one of the many services offered through Roofing by Bruce. By keeping an open line of communication with our manufacturers, our workflow is fast and reliable. We cover soffits, fascia, flashing, ridge vents and flat and low sloped roofs and can handle anything from minor repairs to major replacements. To find out more, give us a call today at 570-424-7250.